Cristiano Ronaldo's popularity levels quite don't quite seem to be slowing down... The Portuguese star topped the rankings for the most marketable football player in the World in 2014, beating his long-time rival Lionel Messi from FC Barcelona, who once more had to settle with the second place. This study was recently published by a sports marketing company called Repucom. 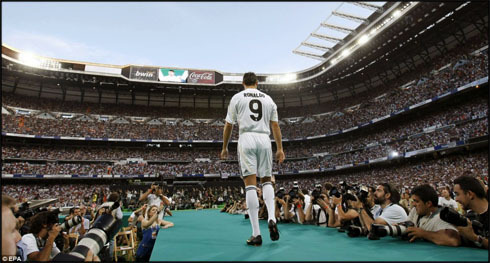 Few other players in this sport have ever had the popularity that Cristiano Ronaldo has these days. His name and his brand have crossed borders for quite some time now and it seems safe to say that nowadays, there's hardly a single football fan out there who doesn't know who Ronaldo is. According to a detailed report from sports marketing reasearch experts, Repucom, Cristiano Ronaldo is second to none when it comes popularity and global awareness, while Lionel Messi and Gerard Piqué from Barcelona are behind him and seating tight in 2nd and 3rd place respectively. This study and rankings are based on the value coming from a tool called the "Celebrity DBI", which measures data collected from more than 6.500 people coming from 13 different international markets. With such a large scope established as the basis of this study, Repucom expects their results to be representing the views of close to 1.5 billion people. We can say it loud and clear: No one even gets close to the global awareness that both Cristiano Ronaldo and Lionel Messi have in the current days. Roughly 83.9% of the people out there know about the Portuguese star, while Messi's name is already known by close to 76% of the general public. This data was stripped from a sample within a large set of 13 countries and which includes Argentina, Brazil, China, France, Germany, India, Italy, Mexico, Russia, Spain, Turkey, the UK and the US. Inquired people in this sample were all aged between 16 and 69 years old. If it's no surprise to see Ronaldo and Messi standing out in the table above, the same can't be said about who comes behind them as number 3 in the ranking. Shakira's boyfriend and Barcelona centre defender Gerard Piqué, seems to have gained a lot more visibility after he started dating the Colombian pop singer back in 2011 and he's basically leading the chase to the two undisputed best players and most popular footballers in the World. The gap from Messi to Piqué is still substantial though and aside from Neymar Jr, it's hard to think about any other footballer with enough potential to come close to those levels of popularity from the top 2 footballers. It's also interesting to note that from the list of these 10 players featured in the ranking, six of them play in Spain either in Real Madrid (2) or Barcelona (4), two play in England (Manchester United and Chelsea), one in France (PSG) and the last one in the United States (New York Red Bulls). As strange as it may seem and since David Beckham is already retired, it appears that it's now up to Thiery Henry to be the ambassador for football in the US. It's also curious to observe that the two clubs contributing with the most players into this ranking, Real Madrid and Barcelona, were also named the two richest football clubs in the World in 2014. As for Neymar Jr, the Brazilian star is still far from the top positions and since he only arrived to Europe roughly a year ago, his global awareness isn't that overwhelming yet. He's incredibly popular in Brazil (he's in fact the most known footballer in his country), but he still has plenty to do in Barcelona before turning into a true global icon. However and at the age of 22, Neymar is certainly set to become one of the most popular and influential athletes in a very near future. Cristiano Ronaldo will join the Portuguese National Team this Thrusday and his next game will be a friendly between Portugal and Greece, on May 31 of 2014. You can watch Juventus live stream, Portugal vs Greece, Spain vs Bolivia, England vs Peru, and Uruguay vs Northern Ireland, all matches provided from our soccer live streaming section.